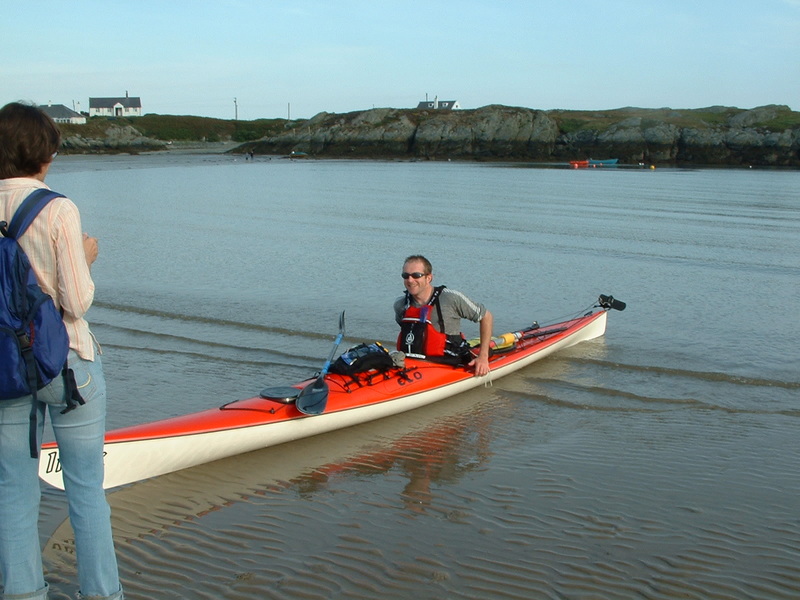 Back in the autumn of 2005, I completed the circumnavigation of Anglesey by sea kayak in a time of 11:30. It was a long day and I remember saying, as we walked back up the beach, that I would not be doing that again in a hurry. I also remember thinking on the journey home, that there was 30-40 minutes to come off the time. It was a figure that was to stick in the back of my mind for the following year. That’s why, on a September morning, the four of us found ourselves standing, rather bleary eyed, on Borthwen beach before sunrise. For once I was early and so we stood around chatting and wondering when the sun would rise and where the water was. After my 2005 attempt I was disappointed to hear some doubting comments, from a few, I thought peevish, local ‘experts’ over the validity of my time. This year there would be no doubt. I had decided to have two witnesses for this effort; two trustworthy, reliable, reasonably well known and beyond reproach individuals. Unfortunately they wouldn’t get out of bed so early and so I had to make do with Mike Webb and Aled Williams from Rockpool Kayaks. Mike was proudly showing off his new video camera with its all singing and dancing low-light setting. Unfortunately the designer had neglected to illuminate the buttons. 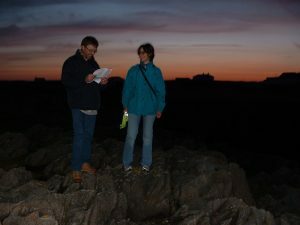 We never got to see how it fared in the dark as Mike could not see enough to switch it on! Soon it was time to leave. 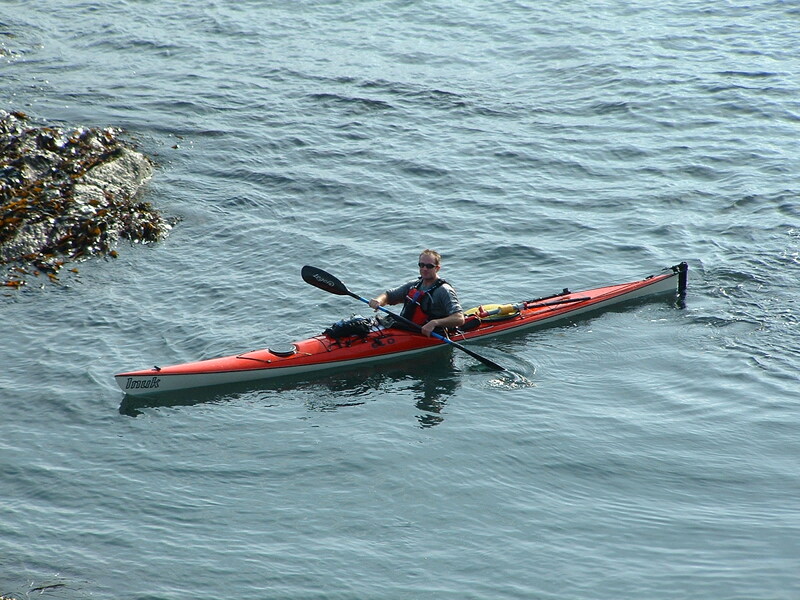 The timing team set off for their vantage point and I paddled out of the bay, passing a just-waking yacht on my way. The clock was duly started and I was underway, the rays of first light just rising over the headland. To find those forty minutes I had tweaked my previous plan a little. This time I was setting off a little earlier, though I had to be careful. If I left too early I would get ahead of the tide and would lose more than I gained. As I headed across Penrhos Bay I could see the smoke from the Aluminium works stack. 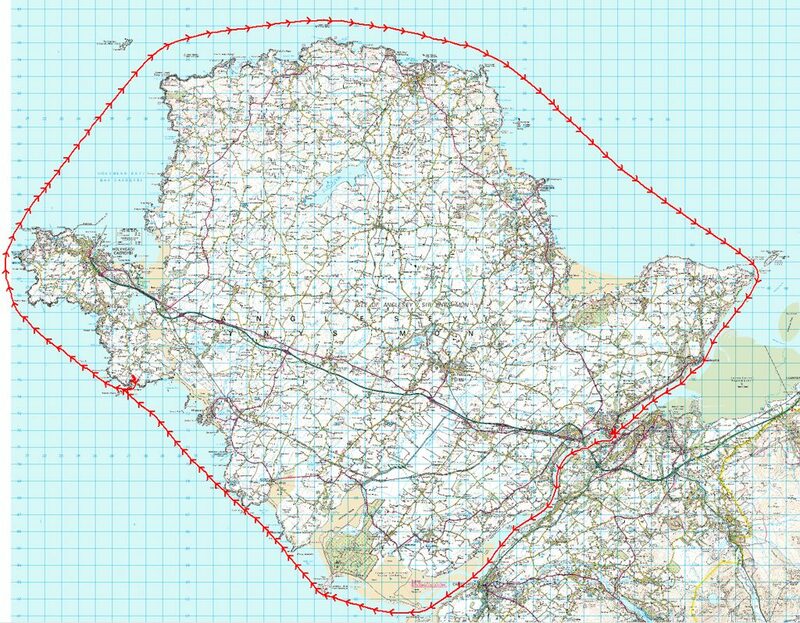 Disappointingly it showed an easterly breeze was blowing, a nice headwind for the trip along the north coast. Oh well. Penrhyn Mawr slipped past smoothly and soon I was drawing level with South Stack. Before I rounded the corner I glanced over my shoulder to see the Lleyn and Snowdonia silhouetted spectacularly against the sunrise. The South Stack tide race was still slumbering with barely a ripple. This was a little disconcerting as I expected a few waves to be forming here, hmm… too early? As I progressed across Gogarth towards North Stack, the early morning light brought out some beautiful colours on Holyhead Mountain. Even though I had checked the ferry sailing times from Holyhead, I was a touch nervous as I crossed Holyhead Bay. 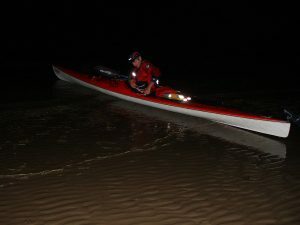 The assistance from the tide was still less than I had hoped for; I was now down on time and was getting a little worried. I would look a real muppet if we had to call it all off because I had got my timings wrong, it wouldn’t be the first-time! As I neared the Skerries I was relieved to see the tide race from the Platters starting to form. The tide was running at last. The headwind made things a little lumpy as I progressed along the north coast, ticking off the landmarks as I went. First the solitary West Mouse then peaceful Cemlyn Bay nature reserve, the hulk of Wylfa Head power station followed soon after by the familiar Middle Mouse. Onwards past the old Porth Wen brickworks hiding in the bay, then sleepy Bull Bay and soon the runt of the litter – East Mouse watching over the old port of Amlwch. I was making progress as I neared Point Lynas, though I was still a little down on the plan. Rounding Lynas, I could make out Puffin Island as a depressingly small smudge on the horizon, skulking below Penmaen Mawr. A yacht had followed me along the north coast, now as I stopped for a bite to eat; it glided past with a cheery good morning from the crew. Realising this could be useful; I put my food away, a quick last sip of water and then off after the yacht. A little faster than I would have liked but it would make a good pace setter on my way towards the Menai Straits. Moelfre came and went, as slowly, Puffin grew on the horizon. As I tried to keep up with the yacht the breeze dropped and the sun rose into the sky, it was starting to get rather warm. I couldn’t afford to lose the boost of chasing the yacht though and so I sweated my way towards Puffin Sound and the Menai Straits. The early start was now paying dividends; I had made good progress down the east coast and was nudging ahead of time. Last year the tide was high enough to paddle inshore of the warning sign by the lighthouse, not this time though. The tide was running nicely through the sound as I turned the corner into the Menai Straits. Beneath a clear blue sky I had a beautiful view of the Snowdonia Mountains as I headed towards Bangor. Beaumaris was awake now; the tourist boats were heading off to visit the seals at Puffin, kids were fishing for crabs from the pier and I had to tentatively sneak through a colourful dinghy race in full flow near Gallows Point. I had planned to meet Pascale at Menai Bridge for a breather, not long to go now. But as I passed Bangor Pier I suddenly ran out of steam, the last few kilometres to the slipway seemed to last forever. Even so I arrived with time in hand. The slipway was a hectic place, with power boats and jet skis seemingly everywhere. I could see no sign of Pascale and was just about to continue when she appeared. Car parking problems apparently, more like snoozing in the sunshine if you ask me! Mike and Aled also made a welcome appearance and so we all sat in the sunshine chatting and eating cakes (of course) whilst I tried to prolong my stay on terra-firma. A yacht skipper came over to say hello. He was on the yacht I passed as I sneaked out of Borthwen in the early morning gloom. 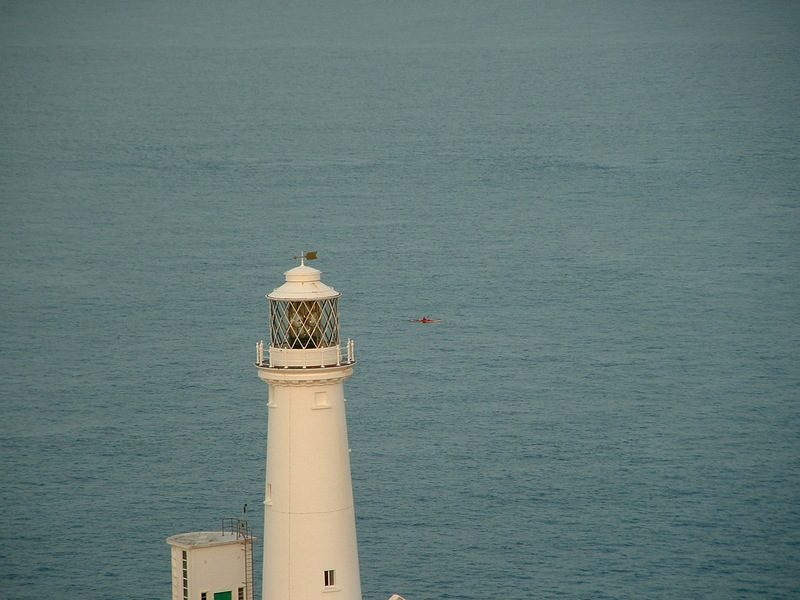 He set off a few minutes later and was also going around Anglesey, but in the opposite direction. All too soon the cakes were finished, the clock was still ticking, so back into the boat and off again. The Swellies flew by in the sunshine, the GPS showed over 12kts as I passed below the lions of Britannia Bridge. Perfect weather as I passed Nelson and the Marquis on my way to Port Dinorwic. Soon I sighted historic Caernarfon, the spectacular castle contrasting with the Morrisons supermarket on the waters edge. I always find the stretch between Caernarfon and Abermenai a little bleak, today was no different. As I neared Abermenai the clouds rolled in and I found myself paddling into a headwind again as a chilly squall blew through. Leaving the Straits I headed across the bar towards Llanddwyn Island. Llanddwyn grew steadily in front of me until I passed the tip of the picturesque island. Still up on time, the GPS showed a predicted finish time of well under 10:30. But I knew this was not to be, as I rounded the end of the island I was expecting the tide to be against me. It was. The early start which had helped me make up so much time during the day was always to have a sting in the tail, here it was. The last leg was to be against the flow, just when energy levels were at their lowest and those parts that I never knew I had were beginning to ache! As I headed north the conditions eased a little as I finally pointed the boat towards the finish line. But as my speed dropped the finish time grew later and later, at one point it was worse than last year’s time. After working so hard through the day this just didn’t seem fair! It was time to stop messing around and get a little angry. Taking a gamble, I turned towards the coast. I hoped all those years of slogging my way up and down rivers would pay off as I aimed to use the eddies to save time. As I ran out of eddy, things were still tight, there was nothing left to do but bite the bullet, pull hard and head straight for the finish. With an hour to go it was time to put on a ‘burn’! Well it should have been. My shoulders really weren’t interested. It was much later before they finally decided to join in! The last few miles passed in a haze as I fought the GPS for the time of 10:45 I craved for, I wasn’t going to let that little box beat me now! About this time last year my shoulder painfully gave up the ghost short of the finish. Not this time though. Mike’s video camera would show a little red dot growing larger and larger until I crossed the line as a perfect example of how not to paddle a boat fast. Not much in the way of technique I had to admit. Leaning back, head down, the boat bobbing madly and blades throwing more water than a washing machine with the door open, I didn’t care – I’d had enough! As I crossed the line my watch showed 10:45. Relieved it was all over, I paddled over to speak to the rest of the team, Aled confirmed the time as 10:45:40. Forty five minutes up on last year, not bad. And so back to the beach where, as I unpacked the boat, the Rockpool chaps kindly produced a bottle of bubbly. Unfortunately I’d polished off the traditional post-paddle cakes earlier! So that was it, this time just over 120 km in a time of 10:45:40. Of course I said “Never again!” – again, as I hobbled up the beach. This time I really did mean it. 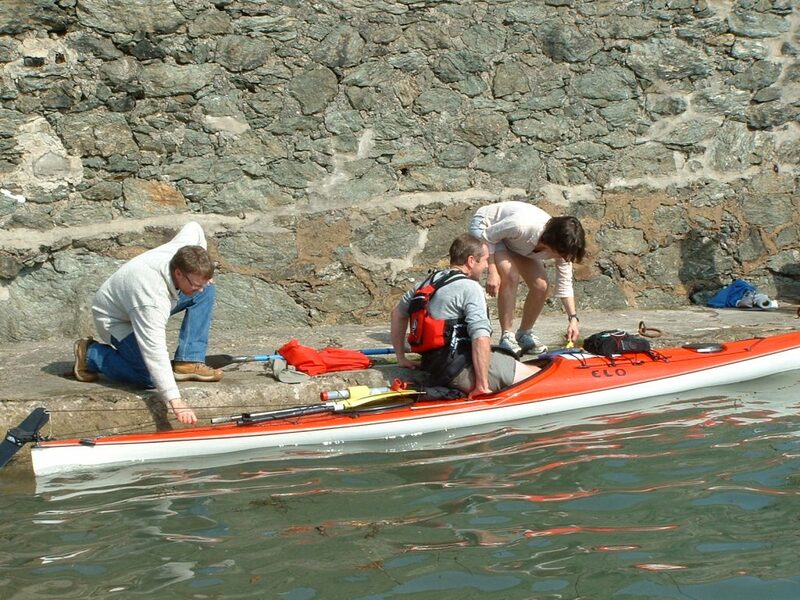 A big ‘thank-you’ to Pascale, Aled and Mike for all their help.